Supra’s have always been close to my heart, having owned 2 of them before and this one being my third i find myself taking pictures of it all the time. My current model is a 2JZ-GTE GZ Aerotop which is quite a rare model for the UK, most of the aerotop examples are usually none turbo. I particularly like this picture as it shows off the Supra’s lines for which they are best known, the artificial lights show off the fresh new colour with all the metal flake. If you want to find out more about the car, check out my ongoing build thread on the Supra owners club here. A brilliant pictorial giving a real insight to the derelict Pripyat area. Superb, very well put together. Thats an amazing book mate, I’ll pass on the link to everyone I know will be interested! Superb book, a terrible disaster very well documented. The audio clips are very eerie but right for the book. 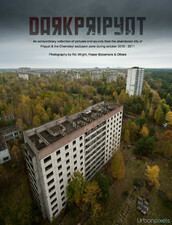 Dark Pripyat Has to be one of the best FREE books i have ever downloaded.